AL-KO Kober Limited – the leading manufacturer of premium components for the automotive, commercial and leisure industries – will be using the CV Show to showcase its range of LCV Chassis solutions and complementary products, with its stand featuring commercial vehicle conversions from companies including Mark Harris and Advanced KFS Special Vehicles. Commenting for AL-KO Kober, David Kirkley says: “2018 is looking like a bumper year for AL-KO and we go to the CV Show having just signed a high-value contract with Mark Harris for the exclusive supply of chassis conversions for its low-floor, Luton box body vehicles. This will see us partner with the UK’s leading manufacturer of this style of box body; and allow us to engineer bespoke LCV Chassis solutions that are designed and tested specifically for their range of vehicles. The contract will see AL-KO Kober deliver over 200 chassis conversions on back-2-back cabs in 2018, with the expectation for the AL-KO and Mark Harris partnership to build and supply an increased number of units in 2019. The AL-KO Kober stand will also feature a traffic management vehicle from Advanced KFS Special Vehicles, a company that has a long relationship with AL-KO having partnered on numerous commercial vehicle solutions since the launch of its Ultra Car Transporter in 2003. AL-KO Kober’s experience in lightweight vehicle chassis design and development ensures that by using lighter materials and engineering techniques to strengthen individual chassis components, the company delivers improvements to the overall efficiency of the vehicle, with its Light Commercial Vehicle chassis solutions being designed to replace those shipped as standard by commercial vehicle OEMs. “Our LCV Chassis conversions are already proven in reducing whole-life operating costs by increasing output and productivity, thus enabling fleet managers to increase profits over the lifetime of their fleet.” says David. From box body low floor luton vans and low-profile car transporters, to larger plant-carrying vehicles, AL-KO Kober’s chassis conversions deliver distinct advantages over standard vehicle options by offering increased load space and payload levels, while retaining a high torsional strength. 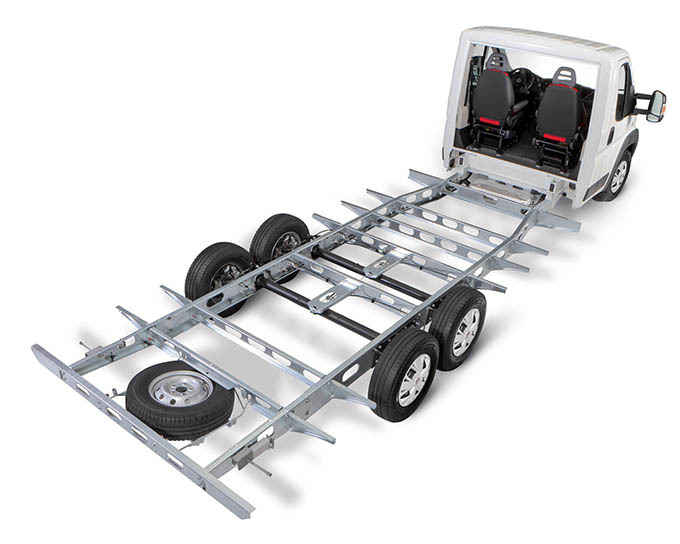 AL-KO’s new LCV chassis conversions are available for Fiat, Peugeot, Citroën and Volkswagen units; and can be up to 145kg lighter than some of the OEM-built vehicles. With innovative low-frame designs, tandem-axle assemblies and wide-gauge chassis, the extensive LCV Chassis range allows customers to adapt fleets to suit almost any application and significantly improve vehicle performance, road handling and driver safety. Hot-dip galvanised frame parts guarantee optimal corrosion protection, while bolted frame parts offer a service-friendly solution and ensure shorter downtimes for repairs and maintenance.